Meckel-Gruber syndrome type 3 (MKS3; OMIM 607361) is a severe autosomal recessive disorder characterized by bilateral polycystic kidney disease. Other malformations associated with MKS3 include cystic changes in the liver, polydactyly, and brain abnormalities (occipital encephalocele, hydrocephalus, and Dandy Walker–type cerebellar anomalies). The disorder is hypothesized to be caused by defects in primary cilia. In humans, the underlying mutated gene, TMEM67, encodes transmembrane protein 67, also called meckelin (OMIM 609884), which is an integral protein of the renal epithelial cell and membrane of the primary cilium. Here, we describe a spontaneous deletion of the mouse ortholog, Tmem67, which results in polycystic kidney disease and death by 3 wk after birth. Hydrocephalus also occurs in some mutants. We verified the mutated gene by transgenic rescue and characterized the phenotype with microcomputed tomography, histology, scanning electron microscopy, and immunohistochemistry. This mutant provides a mouse model for MKS3 and adds to the growing set of mammalian models essential for studying the role of the primary cilium in kidney function. We report here a novel mutation, bilateral polycystic kidneys (bpck), on mouse chromosome (Chr) 4 that causes juvenile lethality from bilateral PKD. This mutation is a 295-kb deletion that includes the Tmem67 gene. Orthologs of this gene are mutated in humans with MKS3 and in the wpk/wpk (Wistar polycystic kidney) rat.10 Because the PKD phenotype of bpck/bpck mutants mimics the pathology of human MKS3,7 this first mouse model will be valuable for studying the cause and progression of MKS3 and cystic disease in general, as well as determining the success of diet, drug, and gene therapies. On a mixed B6C3FeF1/J a/a genetic background (see the Concise Methods section), bpck/bpck mutants typically die by 3 wk of age from bilateral polycystic nephropathy (Figure 1, A through C). Some mutants also develop hydrocephalus, usually detectable within a few days of birth (Figure 2). Smaller than their siblings, mutants are visibly obvious by their swollen abdomens resulting from grossly enlarged polycystic kidneys. bpck/bpck mutant mice exhibit classic PKD; the number and size of renal cysts increase until only a minimal amount of medulla parenchyma remains (Figure 1B). Enlarged glomeruli are rarely seen. Confocal imaging of kidney sections stained for F-actin shows that the cuboidal epithelium lining the tubules flattens as cysts enlarge (Figure 1D). Preliminary light microscopy with periodic acid-Schiff or hematoxylin and eosin staining (n = 1; Figure 1, E through G) shows cysts are detected as early as embryonic day 16 (E16; Figure 1G), the earliest age examined to date. More comprehensive and detailed developmental studies will be required in the future to determine when cysts first appear during embryonic kidney development. Microcomputed tomography shows that the progressive volumetric kidney enlargement is significantly greater in bpck/bpck mutants than in controls (P < 0.0001; Figure 3). Heterozygotes (+/bpck) do not differ from wild-type (+/+) controls; hence, the phenotype is recessive. Gross appearance and histopathology of bpck/bpck and control kidneys. (A) Autopsy image of an 20-d-old bpck/bpck male with ESRD (left) and normal (genotype undetermined) male sibling control (right). Mutant kidneys are bilaterally polycystic and grossly enlarged. Mutant testes are much smaller than those of the control. Viscera in both mutant and control were excised for visibility. (B) bpck/bpck kidney from A. The cortex and medulla have been destroyed by cysts; only a small section of medulla parenchyma remains (arrow). (C) Normal kidney from sibling control with cortex and medulla intact. Bars = 1 mm. Both are hematoxylin & eosin stained. (D) Confocal image of bpck/bpck renal cortex at 17 d. Some residual glomeruli (arrow) and tubules remain in the interstitium. Two early cysts (EC) with cuboidal epithelium and an advanced cyst (AC) with flattened cuboidal epithelium are visible. Stains are phalloidin (green) for F-actin, located in brush border membranes and cellular cytoplasm, and topro3 (orange) for nuclei. The proximal convoluted tubule (PT) in longitudinal section has tall epithelium with a brush border staining strongly for actin, whereas cyst epithelium has very little cytoplasmic actin. The epithelium in cystic tubules resembles that of distal convoluted tubules rather than that of proximal tubules. (E through G) Histopathology of cystic tubules in bpck/bpck mutants at P0 (E and F) and E16 (G; all periodic acid-Schiff stained; bars = 50 μm). Normal tissues are glomerulus (G), distal tubule (DT), and proximal tubule (PT). Some cystic tubules (C) are evident. (A and B) Hydrocephalus in a 2-wk-old bpck/bpck mutant (A) compared with a normal littermate control (B). Hematoxylin and eosin stain. Plots showing progressive enlargement of kidneys in mutants compared with controls (+/+, +/bpck, and +/?). (A) Left kidney. (B) Right kidney. Ages of mice in group 1 are 9 to 12 d (n = 6 mutants, 19 controls), in group 2 are 15 to 17 d (n = 6 mutants, 15 controls), and in group 3 are 19 to 22 d (n = 6 mutants, 13 controls). The original computed tomography volume data were skewed to the right, and inverse transformation was applied to stabilize the variance. Linear mixed model with repeated measure analyses were performed42 with SAS 9.1.3 (SAS Institute, Cary, NC). Mutant mice die before reaching sexual maturity. Ovaries of bpck/bpck females are small but appear normal by light microscopy; however, failure of many transplantations into histocompatible or immune-deficient hosts suggests ovarian dysfunction. Mutant testes are much smaller than those of control littermates (Figure 1A). At 3 wk of age, the progression of maturing cells from spermatocytes to spermatids in mutant testes seems disorganized with degenerating cells present (data not shown). All other tissues appear normal by light microscopy. Mutants do not show hepatic ductal dysplasia and cysts, polydactyly, occipital encephalocele, or cerebellar defects, features present in some patients with MKS3. Light microscopy of brains stained with hematoxylin & eosin from seven postnatal day 14 (P14) and nine P20 mutants showed no cerebellar abnormalities and the same number of cerebellar folia as in littermate controls. Although some mice showed the retinal degeneration common to C3H strains, the retinas of mutants have not yet been studied in detail. Elevated blood urea nitrogen at 2 wk of age can predict mutants before they near ESRD but not early enough to study development. bpck homozygotes seem anemic by crude hematocrit measurements (data not shown). Plasma urea nitrogen values of azotemic mutants are significantly higher than in controls, ranging from 57 to 105 mg/dl (mean ± SEM 73.06 ± 13.19; n = 18). Wild-type and heterozygotes ranged from 17 to 30 mg/dl (mean ± SEM 23.30 ± 4.79; n = 10). 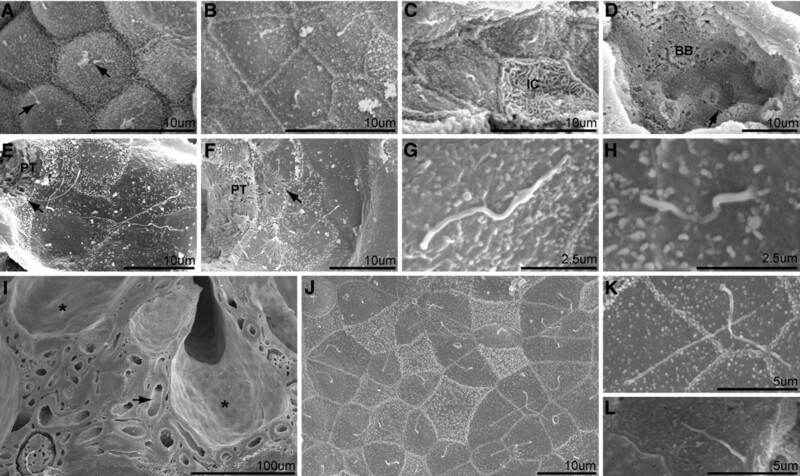 Scanning electron micrographs of bpck/bpck mutant kidneys show mild dilation of some proximal tubules and severe enlargement of renal distal collecting tubules as identified by the presence of intercalating or identifying cells (Figure 4). At birth (P0), the primary cilia on the epithelial cells in these cystic tubules appear dysmorphic and vary in length. By P3, some cilia are elongated, and by P14, many are elongated (Figure 4). Cilium measurements in the distal nephron segments at P14 and P20 (Table 1) show that mutant cilia are significantly longer than +/bpck or +/+ controls. Our analysis confirmed the observation by others11 that cilia were shorter in older (P34, 15 wk) adult wild-type mice than in young wild-type mice. Proximal tubules containing brush border were infrequently dilated in mutants; thus, few cilia were measured in these regions. However, the few cilia we were able to measure in the mutants’ proximal tubules and parietal epithelium of Bowman's capsule were elongated (Figure 4); this needs further investigation. Although several primary cilium defects have been associated with situs inversus, we have not seen laterality anomalies in bpck/bpck mutants. Ultrastructural analysis of cilia in bpck/bpck cystic kidneys. (A) A renal cyst of collecting duct origin from a bpck/bpck mutant taken soon after birth. Each principle cell contains a cilium along with unidentified debris. Arrows demarcate the base of the cilia. (B and C) Distal connecting tubules in a P3 bpck/bpck mutant (B) and control (C). IC, intercalated cell. (D) Low-magnification view of an enlarged P3 bpck/bpck proximal tubule (PT) with an elongated primary cilium (arrow) extending above the brush border (BB). (E) Elongated cilia are observed in the parietal epithelium of the Bowman's capsule in a 2-wk-old bpck/bpck mutant. (F) Age-matched control cilia. The arrows depict the urinary pole where glomerular infiltrates drain into the proximal tubule. (G and H) High-magnification view of a P14 bpck/bpck elongated cilium (G) and an age-matched control cilium (H) from a distal connecting segment of the nephron. (I) A 3-wk-old bpck/bpck kidney at low magnification. *Non-BB renal cysts; arrow demarcates a proximal tubule. A normal-appearing glomerulus is seen in the bottom left corner. (J) Surface of a non-BB cyst in a distal tubule from a 3-wk-old bpck/bpck mouse. Different lengths of cilia are visible. (K and L) High-magnification view of cilia is shown in a bpck/bpck mutant (K) and a wild-type control (L). Specimens were mounted and examined by a Hitachi S3000N scanning electron microscope at 20 kV. Magnifications: ×4500 in A through C; ×3000 in D through F; ×7000 in G, H, K, and L; ×450 in I; ×2300 in J.
Immunohistochemistry using antibodies that distinguish proximal tubules, connecting tubules, distal convoluted tubules, and collecting ducts (see the Concise Methods section) suggests that early postnatal cysts form predominantly in distal segments of the renal tubules. In P3 to P5 mutants, the majority of cysts are in cortical distal tubules with some cysts in collecting ducts. At P14, the majority of cysts are in collecting ducts and collecting tubules. At both ages P5 and P14, proximal tubules seem normal or only slightly dilated (Figure 5). Immunohistochemical characterization of cystic tubules in bpck/bpck mutant kidneys. (Top) P5 and P14 renal tubules double stained with anti-calbindin (red) and anti–aquaporin 2 (Aqp2; green). (Bottom) Adjacent sections of P5 and P14 renal tubules stained with anti-megalin (white). In the younger mutants (P5), the cysts are found primarily in cortical distal tubules (red), with some in collecting ducts (green) and connecting tubules (red/green); some proximal tubules (white) show mild dilation. In the older mutants (P14), the majority of cysts are in the collecting ducts (green). Immunostained sections from a P14 wild-type control are shown on the far right. Bar = 100 μm. By analysis of 2120 meioses in an intercross with CAST/EiJ, we mapped the bpck mutation to an approximately 0.6-cM interval on Chr 4 between D4Mit261 (11.55 Mb) and D4Mit19 (12.11 Mb). All Chr 4 physical locations are taken from Ensembl release 48, NCBI build m37. PCR analysis of the Cdh17 (cadherin 17) gene found a deletion from bp 11,724,161 in intron 10 (ENSMUSG00000028217) through the last exon (exon 18). Further PCR showed that the deletion extends to bp 12,019,908 in intron 2 of C430048L16Rik (ENSMUS00000052317). This deletion of 295 kb affects six candidate genes: Cdh17, Ppm2c (protein phosphatase 2C, magnesium dependent, catalytic subunit, ENSMUSG00000049225), a gene predicted from adult testis cDNA (ENSMUSG00000073995), 1700123M08Rik (Riken cDNA 1700123M08 gene, OTTMUSG00000004564), Tmem67 (ENSMUSG00000049488), and C430048L16Rik (RIKEN cDNA C430048L16 gene; Figure 6). The deletion is not cytologically detectable by G-band analysis. Proximal flanking markers D4Mit264 (9.32 Mb), D4Mit101 (9.62 Mb), and single-nucleotide polymorphism rs27732337 (11.52 Mb) and distal flanking markers D4Mit135 (19.78 Mb) and D4Mit268 (20.54 Mb) show that the region spanning the bpck mutation is derived from its ancestral B6 chromosome. Diagram of the bpck deletion showing the six genes identified within the deleted region and the BACs used for transgenic rescue experiments. BACs RP23-59K6 and RP23-31I19 failed to normalize the mutant phenotype. BACs RP23-203A12 and RP24-229O13 (which contain Tmem67) successfully rescued. The gene C430048L16Rik was not present in either BAC that rescued. For simplicity, not all predicted genes are included in the diagram. Arrows indicate direction of transcription. Delimiting the deletion enables quantitative PCR (qPCR) assays to identify wild-type, heterozygous, and mutant bpck mice (Figure 7A). Apob (apolipoprotein B) on Chr 12 was used as the endogenous control. Primer and probe sequences are listed in Table 2 (1 through 9). The deletion shows stable inheritance as genotypes at both ends (Cdh17 and C430048L16Rik) have always agreed. Genotyping facilitates bpck colony maintenance and allows molecular and histopathologic studies at ages before the mutant phenotype becomes visibly obvious. (A) Scatterplot from qPCR showing genotyping of all three genotypes (+/+, +/bpck, and bpck/bpck) from bpck colony mice using genomic DNA from tail tips. The genotypes are determined using probes for both ends of the deletion, Cdh17 being at the 5′ end. qPCR for Tmem67 gives identical results. Samples 22 through 28 show that no ΔCT calculation from bpck/bpck mice was possible because there was no fluorescence response to the Cdh17 probe, which is within the deletion; however, these mutants did show appropriate fluorescence response to the endogenous control probe Apob. qPCR reactions were run and analyzed on a 7500 Real Time PCR System (http://www.appliedbiosystems.com). Scatterplots were made with JMP 6.0 (http://www.jmp.com) from SAS Institute. Samples 31 and 32 are no template control (NTC). (B) Expression analysis of Tmem67 by PCR with cDNA templates: B, brain; K, kidney; L, liver. Lane 1, NTC; lanes 2 and 15, 100-bp ladder; lanes 3 through 5, RT reaction mix minus reverse transcriptase to detect genomic DNA contamination; B, brain of bpck/bpck; K, kidney of +/bpck; L, liver of +/+; lanes 6 through 8, cDNA amplification with bpck/bpck tissues; lanes 9 through 11, cDNA amplification with +/bpck tissues, lanes 12 through 14, cDNA amplification with +/+ tissues. All samples except NTC are from P8 siblings and contain 300 ng of template per 40 μl of reaction. 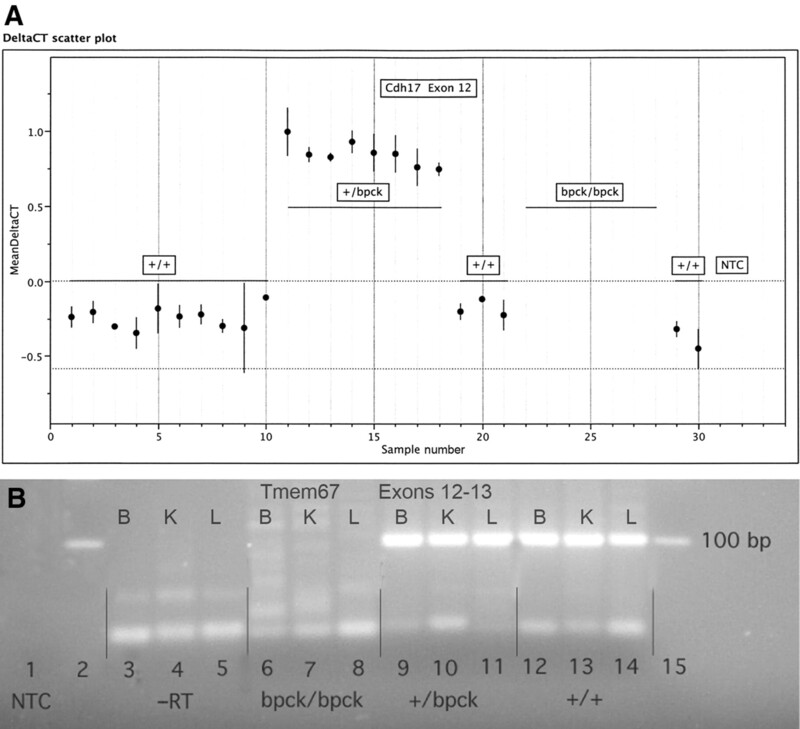 The lack of the 100-bp product from the bpck/bpck samples using primers from exons 12 and 13 (Table 2, 12 and 13) is representative of many cDNA PCR reactions done with exonic primers throughout the Tmem67 sequence and results from multiple mice. To confirm that the deletion is devoid of any extraneous insertion, we designed primers in intron 10 of Cdh17 (Table 2, 10) and in intron 2 of C430048L16Rik (Table 2, 11) to span the deleted region. We amplified a product in bpck/bpck mice but not wild-type controls. Sequence analysis showed a contiguous 1312-bp segment with BLAST results verifying with 99% identity that bp 1 through 1041 match wild-type C430048L16Rik and bp 1042 through 1284 match Cdh17. Identification of TMEM67 as the gene mutated in humans with MKS310 implicated Tmem67 as the gene responsible for the mouse bpck mutation. On the basis of the temporal and spatial expression of Tmem67 in the SymAtlas database (http://wombat.gnf.org/SymAtlas/), we used reverse transcription–PCR and primers within exons 12 and 13 of ENSMUST00000050686 (Table 2, 12 and 13) to confirm that Tmem67 cDNA is amplified in kidney, liver, and brain of P8 +/bpck and +/+ mice. This 100-bp product is absent from these tissues in bpck/bpck mutant siblings (Figure 7B). For direct evidence that the deletion of Tmem67 causes PKD in bpck/bpck mice, we used transgenic rescue with four overlapping bacterial artificial chromosomes (BACs; Figure 6). From crosses with mice of three transgenic lines carrying BAC RP23-203A12 and four lines carrying BAC RP24-229O13 (both BACs contain the Tmem67 gene), bpck/bpck mice with either of the two transgenes are alive beyond 1 yr of age with no symptoms of PKD or hydrocephalus. Sibling mutants without the transgenes developed PKD, and most died at 17 to 20 d (Table 3). No bpck/bpck mutants without a transgene survived beyond 8 wk. Histopathology showed that the Tmem67-containing transgenes rescued the PKD phenotype as well (Figure 8). All seven transgenic lines involving these two BACs gave equivalent success. Histopathologic illustration of transgenic rescue in 15-wk-old mice by a BAC containing the Tmem67 gene. (A) bpck/bpck with transgene showing complete rescue of cystic disease. (B) +/+ littermate control with transgene showing no apparent effect of the transgene on tubules. (C) +/+ littermate control without the transgene. Periodic acid-Schiff stain; Bar = 10 μm. The genetic classes of progeny from the Tmem67 transgenic rescue crosses show the Mendelian results expected for an intercross with the bpck recessive mutation and a backcross with the transgene. Of the 126 mice typed for the transgene, 66 (52.4%) carried the transgene. Of the 164 mice typed for bpck (those with and without the transgene), there were 40 (24.4%) bpck/bpck, 81 (49.4%) +/bpck and 43 (26.2%) +/+. More than twice as many bpck/bpck transgenic mice (n = 29) as bpck/bpck nontransgenic mice (n = 11) were produced, suggesting that the transgene rescued mutants that would have died pre- or perinatally. A deficiency of mutants also is seen in the maintenance colony (with no transgene; 20.5% mutants from heterozygous parents). Measurements of distal and collecting tubule cilia in P34, 7- to 8-wk-old, 15-wk-old (Table 1, Figure 9), and 1-yr-old (not shown) bpck/bpck transgenic mice show that the elongated cilium phenotype also was rescued. Cilia length in bpck/bpck transgenic mice was the same as those from heterozygous or wild-type siblings with or without a transgene. Cilia in 5- to 8-wk-old bpck/bpck transgenic mice were significantly shorter than those in the few surviving littermate mutants with no transgene and those in the 3-wk-old bpck/bpck mutants from the maintenance colony. Genetic background seems to modulate the effect of TMEM67 on cilium length, because in all genotypes from rescue crosses (transgenes are on C57BL/6J), cilia were generally shorter than those seen in the same genotypes of the B6C3Fe-bpck maintenance colony. 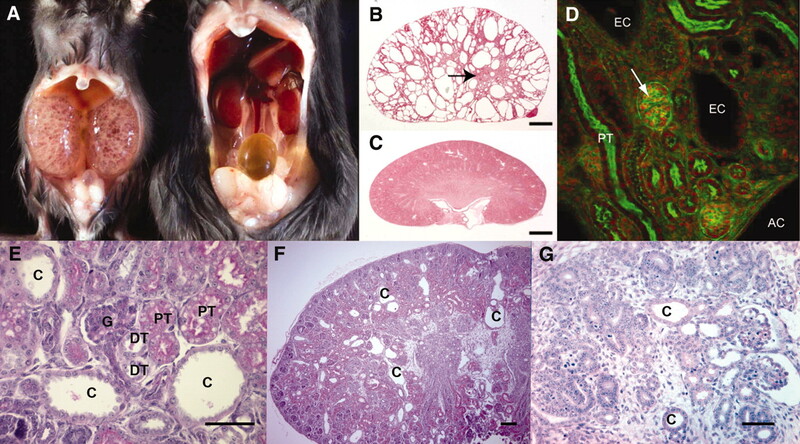 (A through C) Ultrastructural views of bpck/bpck kidneys without (−Tg) and with (+Tg) transgene showing transgenic rescue of P34 (A), P34 (B), and 7-wk bpck/bpck (C) −Tg and 15-wk bpck/bpck +Tg kidneys, respectively. Magnifications: ×100 in A and C; ×7000 in B. The other five genes in the deleted segment were ruled out because (1) the two BAC transgenes containing Tmem67 were the only ones to rescue the phenotype and (2) other genes present in these BACs also were present in BACs that failed to rescue (BACs RP23-59K6, two transgenic lines carrying Cdh17, and RP23-31I19, four transgenic lines carrying Ppm2c and the two predicted genes ENSMUSG00000073995 and 1700123M08Rik; Figure 6). C430048L16Rik was not present in any of the BACs, including the ones that rescued; therefore, none of the other genes in the interval rescues the phenotype, whereas only Tmem67 does. This argues against a contiguous gene syndrome. Proteins involved in transmembrane ion transport and signal transduction, cell proliferation and differentiation, loss of planar polarity of tubular epithelial cells, and ciliary function have been implicated in PKD.9 One of the most popular and evolving pursuits in PKD research is the role of primary cilia.12,13 Cilia occur on a great variety of vertebrate cells14 and affect internal laterality patterning, signal transduction, and cystic disease. The role of primary cilia in PKD has been explored by analysis of mutations in several cilium-associated genes involved in human disorders and mouse models.15,16 Currently, the hypothesis is that the primary cilium plays a mechanosensory role by sensing the flow of fluid in renal tubules and activating intracellular signaling pathways. Polycystin 1 and polycystin 2, encoded by PKD1 and PKD2, respectively, are transmembrane proteins in the ciliary membrane that putatively mediate this mechanosensory function.17,18 Deflection of the primary cilium by fluid flow activates a signaling pathway that regulates epithelial cell growth and proliferation by modulating changes in intracellular calcium ions.17,19 Loss of either polycystin 1 or 2 in humans causes PKD via clonal expansion of renal epithelial cells leading to cystic ducts.18,20 Mice with targeted mutations in Pkd1 and Pkd2 show that both genes are essential for normal kidney development and function.21,22 The gene mutated in human ARPKD (polycystic kidney and hepatic disease 1 [PKHD1])23,24 also has been implicated in cell proliferation and cellular adhesion/repulsion.25 This protein also has transmembrane domains and is expressed in fetal and adult kidney tissue. Meckelin (TMEM67), the protein affected in patients with MKS3, also is a ciliary protein associated with PKD and ciliogenesis. It is a transmembrane protein ubiquitously expressed in human embryos with high levels of expression in the kidney, midbrain, liver, and digits.10,34 The clinical phenotypes of Meckel syndrome and cilium-associated kidney diseases have documented similarities.10,34 Abnormal cilia also are involved in some forms of hydrocephalus,35 which is sometimes present in bpck/bpck mutants, patients with MKS3, and the wpk/wpk mutant rat. In cultured renal tubule epithelial cells, TMEM67 is localized in the cellular and cilium membranes.34 Silencing of the TMEM67 (MKS3) transcript in renal cell cultures caused a marked reduction in cilium formation; thus, TMEM67 is essential for cilium growth either directly or through its interaction with MKS1, a protein that is expressed in the basal body and centrosome.34 In contrast, the bpck null mutation causes cilium elongation, clearly demonstrated by our cilium measurements in multiple mutants and controls at P14 and P20. It is not obvious why reducing the level of TMEM67 protein by siRNA knockdown would reduce the number of cilia,34 whereas total absence would cause elongated cilia. Possibly in the absence of TMEM67 other proteins replace its role in interacting with MKS1 protein in the centriole's migration to the apical membrane (hypothesized to be required for ciliogenesis on the basis of the siRNA experiments). Reduced levels may be sufficient for this interaction but insufficient to enable centriole migration. Alternatively, the absence of TMEM67 in the cilium membrane could result in no biofeedback to regulate the cilium growth. Finally, the difference could be the differences between in vivo and in vitro systems. Our data are consistent with the targeted knockout of the Bardet-Biedl syndrome 4 homolog (Bbs4) gene in mice. Cilia in primary renal cultures from these mice are shorter after 7 d in culture but significantly longer than controls after 10 d in culture. Also, cilia are longer in 3- to 4-mo-old Bbs4 mutant mice than in controls. Perhaps TMEM67-siRNA–transfected cultures would produce elongated cilia if allowed to propagate longer in culture than 96 h. To determine whether absence of TMEM67 in bpck/bpck mutants affects the basal bodies from which cilia originate will require transmission electron microscopic analysis. In the rescue crosses, a few bpck/bpck mice lacking the transgene survived to 8 wk of age. Such survival is infrequently observed in the maintenance strain as well. Because the rescue crosses and maintenance strain have mixed genetic backgrounds, the variability in PKD onset suggests one or more segregating modifier genes that modulate the severity of the disease. Failed attempts to make either C57BL/6J (B6) and C3H/HeJ (C3) congenic strains (few surviving bpck/bpck pups were identified in the litters genotyped) suggests that alleles conferring increased severity and embryonic lethality come from both the B6 and C3 backgrounds. Although five other genes are affected by the bpck deletion, all of the phenotypic defects we have characterized can be attributed to deletion of the Tmem67 gene on the basis of comparison with MKS3. Tmem67 is further implicated as the gene responsible for the bpck phenotype by the complete rescue from PKD, abnormal cilia, and hydrocephalus by multiple lines of two different BAC transgenes containing the Tmem67 gene. We cannot rule out that one of the other five genes in the deletion has a minor effect on the phenotype. Cdh17 encodes a nonclassical cadherin expressed on B lymphocytes; the targeted mutation has not been reported to cause any of the phenotypes observed in bpck/bpck mice.36 We have not studied B cells in bpck/bpck mice. The Ppm2c gene functions in the mitochondrial pyruvate dehydrogenase multienzyme complex. Deficiencies in humans have not been associated with specific phenotypes.37 C430048L16Rik could contribute to the phenotype by regulating gene expression because it contains an RNA-binding motif. RNA-binding proteins modulate gene expression by regulating both coding and noncoding RNAs.38 The gene ENSMUSG00000073995 predicted from adult mouse testis cDNA is not yet characterized for expression in other tissues, and the 1700123M08Rik gene seems to be noncoding. Transgenic BACs containing any of these genes but lacking Tmem67 failed to rescue any of the bpck phenotype. Although neither the wpk/wpk rat nor the bpck/bpck mouse precisely mimics all of the clinical anomalies of MKS3, they provide valuable models for studying the primary pathology, PKD, which is present in 100% of patients. Phenotypic variation can likely be attributed to genetic background modulation, species differences, and/or the result of different mutation types or sites within the gene. Mutations in human MKS3 include two frameshift deletions in exons 3 and 6, two splicing mutations at exons 9 and 15, and a nonconservative missense substitution in exon 11.10 The bp change in exon 12 of the rat wpk gene causes a nonconservative proline-to-leucine substitution at amino acid 394.10 The mouse bpck mutation deletes the entire gene. Because the phenotypes in the bpck/bpck mouse and the wpk/wpk rat39,40 are nearly identical, the wpk mutation also may cause a null allele. The localization of the TMEM67 protein to the ciliary membrane in normal human tissues; the phenotypic similarities of our mutant to the MKS3 disorder of two other species; and our complete transgenic rescue from PKD, hydrocephalus, and abnormal cilia provide convincing evidence that the bpck/bpck mutant is a valuable model of PKD and MKS3. Although the mechanism of ciliary involvement in PKD is still not well understood, proteins of the primary cilium on renal tubular epithelial cells are clearly implicated. Our scanning electron micrographs and cilium measurements showing dysmorphic and elongated cilia in bpck/bpck mutants support this hypothesis; however, the cause-and-effect relationship of cilium length and cystogenesis requires further study to be understood. The bpck/bpck mutant adds another unique model to the growing repertoire of mouse models valuable for exploring the role of abnormal cilia in PKD. This first mouse model for MKS3 is appropriate for elucidating the cause of MKS3 and for testing preventive and therapeutic methods. The bpck mutation arose spontaneously in 1979 in a mixed genetic background of a B6 and C3 substrain, B6C3-tip. We now maintain and analyze bpck on a “hybrid” background by alternately outcrossing +/bpck heterozygotes to B6C3FeF1/J a/a mice and intercrossing to identify +/bpck breeders for the next outcross generation (B6C3Fe a/a -bpck/J; JAX stock no. 8044, The Jackson Laboratory, Bar Harbor, ME). Because heterozygotes in both the colony and linkage cross are unaffected and 41 (20.5%) of 200 colony mice were mutants, bpck is inherited as a recessive allele. The Jackson Laboratory (JAX) adheres to the guidelines in the National Institutes of Health Guide for the Care and Use of Laboratory Animals. All procedures are approved by JAX Institutional Animal Care and Use Committee. All mice were maintained on a 14-h on/10-h off light cycle and fed NIH31 (6% fat) diet and acidified water ad libitum. We genetically mapped bpck using an intercross between +/bpck heterozygotes from the B6 incipient congenic stock and mice of the inbred Mus musculus castaneus strain CAST/EiJ and genome scanning for associations with single nucleotide polymorphisms and Massachusetts Institute of Technology markers. Multiple transgenic lines were generated on the C57BL/6J background using BACs that contain two or more of the genes in the deleted region. No visible or histopathologic phenotypes have been observed in mice of any of the transgenic strains. Several of the cryopreserved strains are available from TJL (Table 4). +/bpck heterozygotes from the bpck stock were mated to mice hemizygous for BAC transgenes. Genotyped Tg/0 +/bpck progeny were backcrossed to +/bpck mice (partial backcross), and the progeny were genotyped for the transgene and bpck and observed for symptoms of PKD. Genomic DNA from tail tips was extracted with 97°C-heated 50 mM NaOH (pH 12.3) for 1 h and neutralized with 1 M Tris-HCl (pH 5.4). Standard PCR reactions used Master TaqKit (Eppendorf 0032002.650) with PCR conditions: One cycle at 97°C for 30 s, one cycle at 94°C for 15 s, 40 cycles of either 55 or 60°C for 30 s, one cycle at 72°C for 10 min, one cycle at 4°C for 15 min, and one hold cycle at 10°C. qPCR (quantitative PCR) was performed on a 7500 Real Time PCR System (http://www.appliedbiosystems.com). Sequencing PCR used Taqpolymerase from Roche Applied Science (1596594), and products were sequenced using a 50-cm array on an AB 3730xl with BigDye Terminator kit 3.1 (Applied Biosystems – Life Technologies, Carlsbad, CA). Postcycling cleanup of sequencing product used CleanSeq (Agencourt Bioscience Corporation, Beverly, MA). Results were analyzed with Sequencher v4.2 (Gene Codes Corp.). RNA was extracted with TRIzol (Invitrogen 15596; Invitrogen – Life Technologies, Carlsbad, CA) and isolated DNA-free with RNAqueous-4PCR (Ambion 1914; Ambion – Life Technologies, Carlsbad, CA). cDNA was made with High Capacity Reverse Transcription Kit (Applied Biosystems 4368814). All PCR primers and TaqMan probes are displayed in Table 2. Specimens for light microscopy were prepared by intracardiac perfusion with saline flush and Bouin fixative after animals were anesthetized with nonrecovery dosages of tribromoethanol (Avertin, prepared by JAX's Laboratory Animals Health Services, Bar Harbor, ME). Tissues were sectioned and stained by JAX's Histopathology & Microscopy Sciences. The confocal microscope was a Leica TCS NT (Depew, NY). The progression of cyst development, from postnatal day 9/10 to lethality, was followed with microcomputed tomography (microCAT II; Siemens Medical Solutions, Knoxville, TN) by JAX's in vivo Imaging Service. Mutant and normal-appearing controls from five litters were imaged at the same time every 3 to 4 d from 9 to 10 d of age to ESRD (19 to 21 d). Practical limitations of our imaging equipment prevented examination of younger mice. Kidneys for scanning electron microscopy were fixed in 2.5% glutaraldehyde in 0.1 M cacodylate buffer, dehydrated to 70% alcohol, freeze-fractured in liquid N2, rehydrated in 0.1 M cacodylate buffer, treated with osmium, rinsed with buffer, dehydrated in graded alcohol up to 100% absolute, dried with hexamethyldisilazane, and coated with gold sputter to 19.32 g/cm3. Images were viewed on a Hitachi S3000 scanning electron microscopy microscope at 20 kV (Hitachi High Technologies America, Persippany, NJ). Cilia were measured using Quartz PCI V.5.1 software (Quartz Imaging Corporation, Vancouver, Canada). Kidney sections prepared as for light microscopy were stained with fluorescently tagged antibodies to megalin (sc-20609; Santa Cruz Biotechnology, Santa Cruz, CA; proximal tubules), aquaporin 2 1:300; collecting ducts and connecting tubules, Dr. E. Klussman, Leibniz-Institut für Molekulare Pharmakologie, Berlin, Germany), and calbindin-D28K (1:200; Sigma, St. Louis, MO; distal convoluted tubules and connecting tubules). Double labeling with antibodies to aquaporin 2 and calbindin distinguishes connecting tubules from collecting ducts and distal convoluted tubules. Blood chemistries were determined by Affiliated Laboratories (Bangor, ME). This research was supported by the National Institute of Diabetes and Digestive and Kidney Diseases grant R01-DK064674, National Center for Research Resources grant P40-RR001183, and a Cancer Center Core grant (CA34196). G.B.C. and J.K.N. were supported by National Institutes of Health grants R01-DK46977 and R01-HD036878. We thank Priscilla Lane and Jane Barker for discovering and giving us the bpck mutation. We also thank Dr. Anthony Nicholson and Crystal Davis at In Vivo Imaging for microcomputed tomography analysis, Jesse Hammer at Multimedia Services for assistance with preparation of figures, the personnel of Molecular Biology and Microinjection/Cell Biology Services for BAC preparations and microinjections, Coleen Marden for tissue collection, Brenda Sprague for colony maintenance, Peter Finger and Yong Suk Lee for assistance with scanning electron microscopy, the personnel of Clinical Pathology for urinalysis, and Weidong Zhang at Computational Sciences for data analysis. We thank Dr. James Mandell, President and Chief Executive Officer, Children's Hospital, Boston, for advice and reading the manuscript and Kenneth Johnson and Stephen Murray for critical review of the manuscript. Dr. Enno Klussman kindly provided the aquaporin 2 antibody. S.A.C. and M.T.D. contributed equally to this work.